How Harry Potter Has Brought Magic To Classrooms For More Than 20 Years In the 20 years since Harry Potter and the Sorcerer's Stone was released in the U.S., educators of all levels have used J.K. Rowling's series to bring magic to their own classrooms. 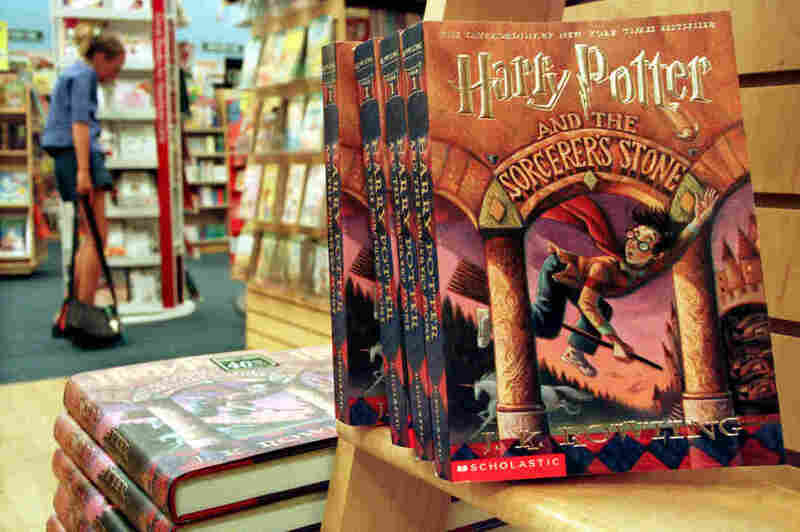 J. K. Rowling's Harry Potter series story books sit in a bookstore July 6, 2000 in Arlington, Va. Whether you're a Gryffindor, a Hufflepuff, a Ravenclaw, a Slytherin or a muggle still hoping your Hogwarts letter will arrive by owl, it is undeniable that the Harry Potter fandom has had a lasting impact throughout the world. September marked the 20th anniversary of Harry Potter and the Sorcerer's Stone's U.S. release. NPR asked teachers then to tell us how the book has changed the way they teach. We learned that a lot has changed since 1998. Quidditch is no longer just game of fantasy. Fantastic Beasts and Where to Find Them is more than a textbook to pick up in Diagon Alley. And Hogwarts is no longer a place you can only dream of visiting. More than 1,000 educators, from elementary teachers to university professors, responded to NPR's callout with stories about how they incorporate the Harry Potter series into their curriculum and classrooms. Teachers like Ben VanDonge and Kate Keyes are two-thirds of a fifth-grade teaching team in Walla Walla, Wash. This year marks their third year doing an all-encompassing Harry Potter theme. "We have a sorting ceremony at the end of the year to let kids know which homeroom they'll have, play our own version of quidditch about once a month," VanDonge says. VanDonge's classroom is decked out in Ravenclaw blue and bronze while Keyes has Hufflepuff's black and yellow. The building is older and has arched windows, much like those at Hogwarts that let natural light stream in. In one corner of Keyes' room is a Whomping Willow, the tree that terrorized Harry and Ron after they crash-landed Mr. Weasley's enchanted car between its branches. And after a couple of years with just Hufflepuff and Ravenclaw representation, Keyes and VanDonge convinced their third partner teacher to join in on the engaging learning community. This year his students are Gryffindors. After being sorted into their houses and homerooms, the fifth graders begin their deeper dive into the wizarding world. Kate Keyes and Ben VanDonge are two-thirds of a fifth-grade teaching team in Walla Walla, Wash. This year marks their third doing an all-encompassing Harry Potter theme. "We burn through Sorcerer's Stone in about three weeks as a read aloud using the Jim Kay illustrated edition so all our kids have access to the theme and don't just think we're crazy," VanDonge says. "We refer back to the story frequently as we teach language arts concepts, too." VanDonge and Keyes said they felt like they struck gold when they heard how the curriculum was helping their students outside of school. "We knew that we were doing a good thing when at conferences...we had numerous parents tell us it was the first time that their kids had been excited to go to school since kindergarten," VanDonge says. "Or tell us that they've never been able to get their kids to read at all before and now they're having to have lights out rules." As enthusiastic as some parents are about how Harry Potter has helped their children in school, it hasn't always been that way. A year after the first book's U.S. release, it found a place on the list of most challenged books compiled by the American Library Association's Office for Intellectual Freedom. The series had a steady presence on this list and even topped it at times, through 2003. Parents in many states tried to push school boards and districts to ban the books. One of the biggest criticisms of the series comes on religious grounds that the books promote occultism and magic. In October 1999, author Judy Blume penned an Op-Ed in The New York Times titled "Is Harry Potter Evil?" As an author, Blume is familiar with challenges to children's literature as some of her works have also topped the banned books list. Blume wrote, "I knew this was coming. The only surprise is that it took so long — as long as it took for the zealots who claim they're protecting children from evil (and evil can be found lurking everywhere these days) to discover that children actually like these books." Today, there are still parents opposed to the series and some schools don't allow the books to be taught or included in teachers' curriculum. Cynthia Richardson teaches eighth grade English just north of Bellingham, Wash. She uses the wizarding world as a basis for her behavioral management system, but she does not teach the books. 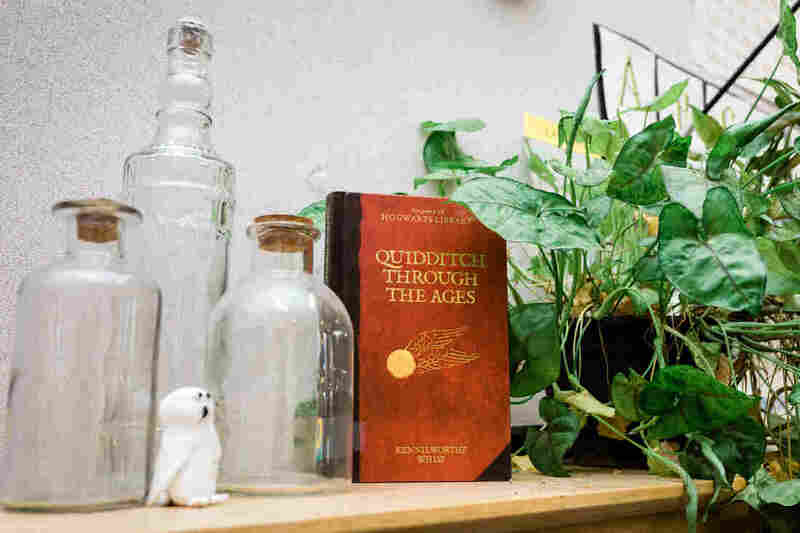 "I kind of started growing the classroom and making the classroom look like the world of Harry Potter...that's when I started encountering some parents who were hesitant," Richardson says. "So I actually put a disclaimer in my syllabus that this was not intended to teach witchcraft or that I was not going to teach the book because parents had been saying 'we don't agree with that book option.' "
Richardson has had some parents ask that their children not be placed in her class because of the theme. Other parents who have been initially opposed or unsure have at times met with her to discuss the situation. She says all of the pushback she has gotten stems from the theme of witchcraft in the books. This is something Richardson can relate to. Growing up, she says her parents did not allow her to read the books, so her first experience with them was in a children's literature course during college. "You know, I understand wanting to protect children from things that we think they're not ready for, especially some of the later books that are much darker, and I talk with them about what the power of literature can be" Richardson says. "How maybe it's an opportunity for them to read with their child in this case and talk about those themes and talk about the struggles that are in them and what a powerful learning opportunity that could be for the child." Since the series began, more than 500 million copies of the books have been sold worldwide, according to Pottermore, and the books are available to readers in 80 languages. Deborah Stack teaches English as a second language at a middle school in the Bronx, N.Y., and says her classroom is mainly divided between Spanish speakers and Arabic speakers. Finding engaging material in those two languages has been hard, Stack says, especially because her students vary in their reading levels in both their native languages and English. But this year, she decided to try reading Harry Potter and the Sorcerer's Stone with them after she found the digital editions in both Spanish and Arabic. "They were so into it like I would end class and they would moan," Stacks says. "They would be like, 'Oh, it's over. I want to read more,' which never happens. It's just like the perfect combination of accessible language." As her students continued to make their way through the first book over this fall semester, Stack says she watched conversations start between the kids who didn't speak the same language. "When you start making sure the whole class is reading the same story and that story is really exciting, that story is really engaging, you start to see kids like really talking between language groups and debating and arguing," she says. It was this moment that really made her excited as a teacher. "You're seeing this amazing dialogue in English between a native Arabic speaker and a native Spanish speaker and they're utilizing their English and are talking about the same story," Stack says. "They're not doing it because I asked them to, they're doing it because they're really excited about the story and that's where you get the authentic debate and discussion, which is what you want in an English classroom." For many of the teachers who watch their students discover the magic of reading that the series brings, it reminds them of their own introduction to the series. Shehtaz Huq was 9 and at her grandmother's funeral in Bangladesh when she found the first book in her aunt's purse. "She gave me the book to read because that was the first time that I had experienced death in the family and I didn't know how to deal with grief and then the book opened with the death and grief and loss, so that really resonated with me," Huq says. Huq quickly devoured the rest of books as they came out and went on to become sixth grade English teacher. 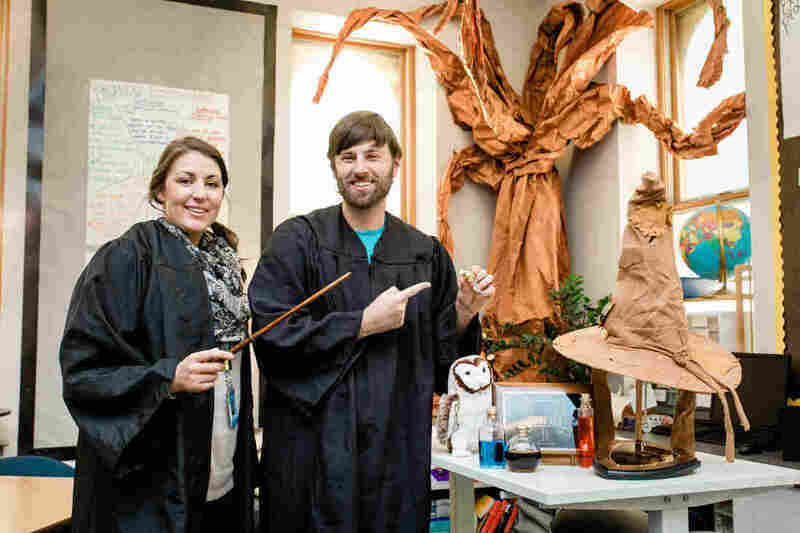 In her classroom, all of her students receive a Hogwarts letter at the beginning of the year. On one wall the Hogwarts Express is waiting at platform 9 ¾ with inspirational quotes coming out of the engine's smokestack. There's also dementors because Huq says she wants her students to "see the dichotomy of good and evil." "In sixth grade, we read a set of novels and the essential understanding is how individuals can overcome adversity through the help of community," Huq says. "I wanted students to see how the students at Hogwarts and the adults in Hogwarts found their community whether it was their biological family or their chosen family." The Harry Potter books are a natural choice for English and literature classes, but that hasn't stopped STEM teachers from finding connections for their students. Kelsey Hillenbrand teaches middle school math in Evansville, Ind. Floating candles like those in the Great Hall hang from her ceiling along with moving portraits for an immersive experience. Hillenbrand acknowledges that part of the nature of math is to learn concepts and then review and practice them, but for at least three times during the year, she goes one step further with her classroom theme. "When we were studying fractions and decimals, I cover all of my desks with butcher paper to look like the wooden tables that you see in Snape's classroom — and we had potions class. Cauldrons were placed in front of students, along with their supplies, and a large packet of problems, because after all, it's still math class. "I think they ended up solving like 60 questions that were all fractions and decimals. But each page had its own little puzzle so that they knew how much of each ingredient to add to their cauldron," Hillenbrand says. In the end, Hillenbrand checks to make sure the solution is the right tint before the students get to drink their potions. "They're learning something and it's just taking that fear and that edge out of it and to see them come back in and say 'What are we going to do today, Mrs. Hillenbrand? '," she says. That excitement and openness to learning is what many of these teachers consider the true magic of Harry Potter and they have no plans of stopping.